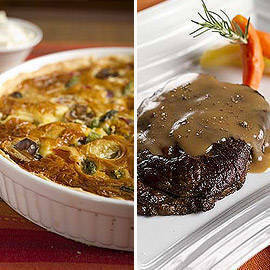 Savor their family favorites and trademark recipes. Vegetable Quiche (left) and Rosemary and Garlic Rib-eye (right) at Lola Maria Restaurant. Click for more photos. 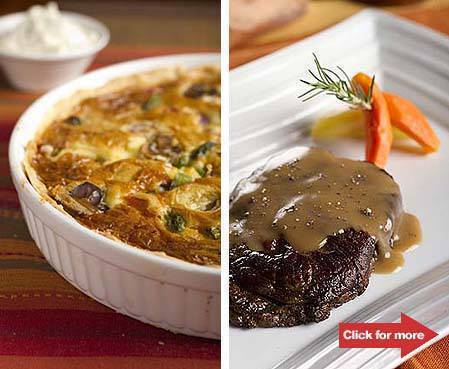 Curious about which dishes your favorite celebrities love having on the table? Actress Iza Calzado, Ford Supermodel winner Danica Magpantay and designer Randy Ortiz are among the celebrities who shared their Pinoy food favorites and family recipes for Lola Maria Restaurant’s new "Celebrity Dishes." Available at the restaurant starting February 1, the star-studded menu lets you choose from eight dishes inspired by the following celebrities: Iza Calzado’s Fish Pinipig, Ara Mina’s Rosemary and Garlic Rib-eye, Wilma Doesnt’s Fried Suman at Tsokolate, Sherilyn Reyes-Tan’s Ube and Langka Panna Cotta, Danica Magpantay’s Ensaymada Pudding, designer Randy Ortiz’s Vegetable Quiche, show car maker Atoy Llave’s Prawn Cakes, and blogger Anton Diaz’s Cocido. According to Ginger Villavicienco, Chief Operating Officer of the Legend Villas, "The recipes were shared by our celebrity friends. We just made sure we give each dish that distinct Lola Maria Restaurant twist." Lola Maria’s Chef Mike Martinez conceptualized the dishes, taking the recipes shared by the celebrities and making them Lola Maria’s own. All eight dishes may be ordered as a set menu for a minimum of five people starting February 1 for only P1,350 net per person, and includes one beverage (your choice of Dalandan Slush, Pomelo Slush, or Pandan Iced Tea). The dishes are also available in family and party packs except for the rib-eye Steak, and is part of the many new innovations at the Filipino restaurant at the Legend Villas.